Our lawyers are recognized for their litigation expertise – gained through our long experience in litigating cases at every level of court, before more than 25 different administrative and regulatory bodies and as both counsel and neutrals at many arbitration and mediation proceedings. McEwan Partners lawyers are ranked among the best by our peers and colleagues and we recruit and mentor lawyers who are committed to maintaining a high standard in their practice. We have expert legal skills and provide sound advice to our clients in every litigation dispute. Our lawyers include seven former judicial clerks, including three in the Supreme Court of Canada. Our lawyers have been inducted to the American College of Trial Lawyers, the International Society of Barristers and Litigation Counsel of America. 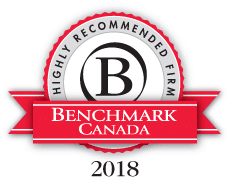 McEwan Partners lawyers are consistently recognized by peer review agencies including Chambers Canada, Martindale Hubbell, Lexpert, Benchmark, Who’s Who and Canada’s Best Lawyers. 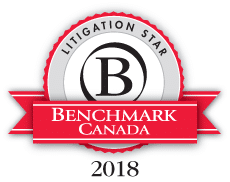 Recognition of our lawyers includes ranking in the top 50 trial lawyers in Canada, class action lawyer of the year in British Columbia, administrative lawyer of the year in British Columbia, 2018 top 500 leading lawyers in Canada, and 2018 top 100 leading cross-border litigators in Canada. 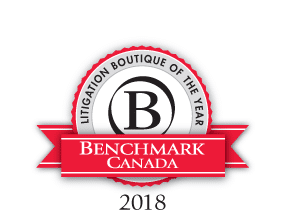 Benchmark Canada has named McEwan Partners Litigation Boutique of the Year for 2018. Selected from among firms across Canada, McEwan Partners was the only nominee from British Columbia in this category, and the first British Columbia firm to win this award. The firm was also the only litigation boutique nominated for British Columbia Firm of the Year, and extends its congratulations to Fasken, the winner in that category. Benchmark Canada has awarded Ken McEwan, Q.C., its British Columbia Litigator of the Year award for 2018. This marks the fifth time in the six years since the award’s inception that Ken has received this honour. In the upcoming Benchmark Canada 2018 Guide, each of Ken McEwan, Q.C., Bob Cooper, Q.C., Craig Dennis, Q.C., and Sandra Foweraker will be recognized as Litigation Stars. Owen James and Emily Kirkpatrick will be recognized as Future Litigation Stars. In addition, the firm is ranked as Highly Recommended – one of just ten British Columbia firms to receive that designation.